We’d love your help. Let us know what’s wrong with this preview of Walk Gently This Good Earth by Margaret Craven. The story of the Westcott family of the American West, through the Depression to about 1976. It depicts an idyllic childhood in the Pacific Northwest and later years in Montana. 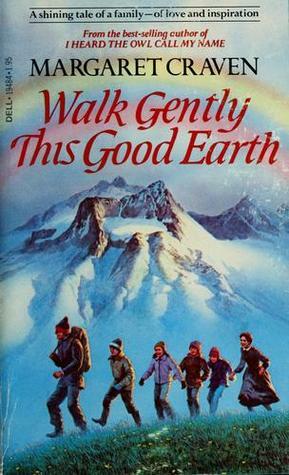 To ask other readers questions about Walk Gently This Good Earth, please sign up. Everything is told and hardly shown, and it is so beautiful. It's about the past, loving the past, and setting store by the past, loving the past. But it's also about the future, and it's also about the cycle of life. Its pain, its beauty, and its simplicity. A depression era story about small-town America. A feel good story from the author of "I Heard the Owl Call My Name." This is an admirable story told of Judge Westcott, who with the help of his devoted young housekeeper, raised his four motherless children and foster son. Their journeys take them from the Pacific Northwest to Montana, from the Depression to 1976. This is an excellent family novel! I don't understand why so many people like this book. It starts off decent - not great but decent - and then it just continues and continues with more and more generations with more more characters that are hard to keep straight and it doesn't really seem to ever have a plot. A gentle sharing of the life of a family through a number of years in Montana. Final statements about the American Spirit. A very enjoyable read. Margaret Craven (March 13, 1901 – July 19, 1980) was an American author.